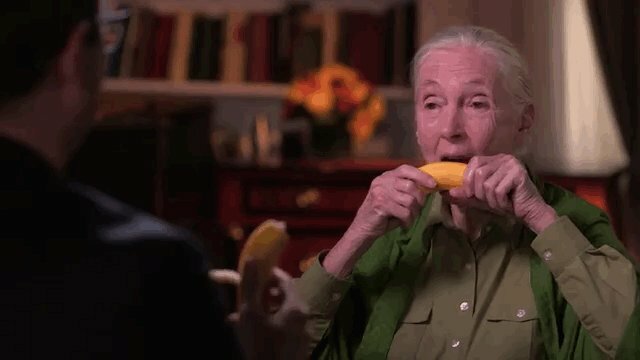 Sunday's episode of "Last Week, Tonight" featured John Oliver musing about how great a monocle-wearing chimpanzee would be as a pet - a plan which renowned primatologist Dr. Jane Goodall promptly (but good-naturedly) shut down. No, John Oliver, no. "I don't like you," says Goodall, after Oliver asked the all-important question, "Did you ever put a hat on them?" Though Goodall rejected Oliver's suggestion of "Jessica Chimpson" as a potential chimp name, "Poo-throw Hitler" did make the cut. They finished it all off with some chimp noises and banana ("chimp-ways," of course). I'm very much against keeping cetaceans in captivity for several reasons. I love them; to know that they can communicate across hundreds of miles under the water ... and to actually watch them out there in the ocean is absolutely glorious. When I see them in a little tank it hurts, so that's the emotional side of it. On the scientific side of it, it's the acoustical nightmare that they live in in these little tanks. "Acoustical nightmare" is what I think Roger Payne called it. You'll find that the beluga has the most varied communication calls of anybody; sounds described as beeps and squeaks and roars ... with which they communicate with different things in the ocean.